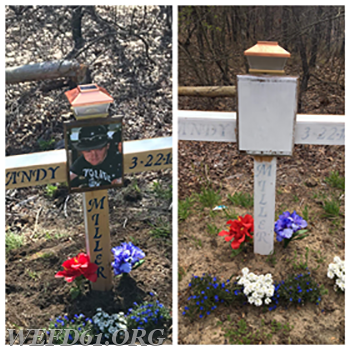 The family of a recent accident fatality victim is looking for anyone who was near Mclendon Hills Drive and NC Highway 211 this week and may have seen anything suspicious near the site of a memorial placed by the roadway that was vandalized. The young man killed collided with a tractor-trailer on March 22nd and passed away on the scene. Within days of the accident his father had built a handmade memorial for the accident site. The memorial was placed beside the road in the area of the accident on March 26th. Sadly someone went out and has vandalized the memorial after it was placed. The vandals took white paint and a paint brush and proceeded to paint over the entire thing, missing only the solar light on the top. They also stomped one side of the blue flowers that the father had planted. The victims 12 year old son and his sons mother are the ones who had to see this cruel act of nature up front and personal as they drove past the memorial after it had happened according to family members.